Eel River Brewing Company is unique not only in the fact that they are an organic brewery, but that they were the first all-organic brewery in America. And in keeping with the earth friendly theme every year on Earth Day (April 22nd) they brew this special double IPA to help raise awareness and actually give a portion of all the proceeds back to the California Certified Organic Farmers. So by drinking this beer you not only get to enjoy a well made double IPA but your giving to a good cause. So here's to Earth Day and to a well-balanced and quite delicious double IPA! Cheers! Appearance: The Earth Thirst pours a bright copper color with really nice amber hues. The head is easily two-fingers with a nice off-white color. The head stuck around long enough to leave some of the nicest lacing I’ve seen since grandma stopped stitching. Smell: The smell is actually not I expected. The initial scent is a substantial caramel sweetness followed by a subtle toasted grain and grass. Hiding behind the upfront sweetness is a nice kick of grapefruit and floral hops. There is a slight alcohol ester on the finish. Initial Taste: The taste is good but not as sweet as the smell would suggest, thankfully I might add. It does start off with a subtle sweetness that’s more malt than caramel but still nice. There is also a sweet citrus that sweeps quickly across the tongue. This of course is quickly forgotten as the hops make their way onto the playing field. Big notes of pine, grapefruit and grassy hops overcome the taste-buds leaving a nice slightly bitter, slightly dry taste in the mouth. The finish is dry and spicy but with just enough sweetness to leave a (nearly) balanced aftertaste. Thoughts: Eel River Brewing Company is unique not only in the fact that they are an organic brewery, but that they were the first all-organic brewery in America. And in keeping with the earth friendly theme every year on Earth Day (April 22nd) they brew this special double IPA to help raise awareness and actually give a portion of all the proceeds back to the California Certified Organic Farmers. So by drinking this beer you not only get to enjoy a well made double IPA but your giving to a good cause. 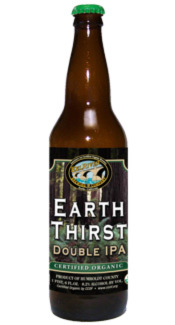 So here’s to Earth Day and to a well-balanced and quite delicious double IPA! Cheers!